Italian cardinal and theologian, born at Monte Pulciano, in Tuscany, on the 4th of October 1542. He was destined by his father to a political career, but feeling a call to the priesthood he entered the Society of Jesus in 1560. After spending three years at Rome, he was sent to the Jesuit settlement at Mondovi in Piedmont, where he studied and at the same time taught Greek, and, though not yet in orders, gained some reputation as a preacher. In 1567 and 1568 he was at Padua, studying theology under a master who belonged to the school of St. Thomas Aquinas. In 1569 he was sent by the general of his order to Louvain, and in 1570, after being ordained priest, began to lecture on theology at the university. His seven years' residence in the Low Countries brought him into close relations with modes of thought differing essentially from his own; and, though he was neither by temperament nor training inclined to be affected by the prevailing Augustinian doctrines of grace and free-will, the controversy into which he fell on these questions compelled him to define his theological principles more clearly. On his return to Rome in 1576 he was chosen by Pope Gregory XIII to lecture on controversial theology in the newly-founded Roman College. The result of these labors appeared some years afterwards in the far-famed Disputationes de Controversiis Christianae Fidei adversus hujus temporis Haereticos (3 vols., 1581, 1582, 1593). These volumes, which called forth a multitude of answers on the Protestant side, exhaust the controversy as it was carried on in those days, and contain a lucid and uncompromising statement of Roman Catholic doctrine. 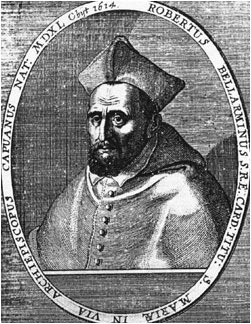 For many years afterwards, Bellarmine was held by Protestant advocates as the champion of the papacy, and a vindication of Protestantism generally took the form of an answer to his works. In 1589 he was selected by Pope Sixtus V to accompany, in the capacity of theologian, the papal legation sent to France soon after the murder of Henri III. He was created cardinal in 1599 by Pope Clement VIII, and two years later was made archbishop of Capua. His efforts on behalf of the clergy were untiring, and his ideal of the bishop's office may be read in his address to his nephew, Angelo della Ciaia, who had been raised to the episcopate (Admonitio ad episcopum Theanensem, nepotem suum, Rome, 1612). Being detained in Rome by the desire of the newly-elected pope, Paul V, he resigned his archbishopric in 1605. He supported the church in its conflicts with the civil powers in Venice, France and England, and sharply criticized King James I for the severe legislation against the Roman Catholics that followed the discovery of the Gunpowder Plot. When health failed him, he retired to Monte Pulciano, where from 1607 to 1611 he acted as bishop. In 1610 he published his De Potestate summi Pontificis in rebus temporalibus directed against the posthumous work of William Barclay of Aberdeen, which denied the temporal power of the pope. Bellarmine trod here on difficult ground, for, although maintaining that the pope had the indirect right to depose unworthy rulers, he gave offence to Paul V in not asserting more strongly the direct papal claim, whilst many French theologians, and especially Jacques Bossuet, condemned him for his defense of ultramontanism. As a consultor of the Sacred Office, Bellarmine took a prominent part in the first examination of Galileo Galilei's writings. His conduct in this matter has been constantly misrepresented. He had followed with interest Galileo's scientific discoveries and a respectful admiration grew up between them. Bellarmine did not proscribe the Copernican system, as has been maintained by Reusch (Der Process Galilei's and die Jesuiten, Bonn, 1879, p. 125); all he claimed was that it should be presented as an hypothesis until it should receive scientific demonstration. When Galileo visited Rome in December 1615 he was warmly received by Bellarmine, and the high regard in which he was held is clearly testified in Bellarmine's letters and in Galileo's dedication to the cardinal of his discourse on "flying bodies." The last years of Bellarmine's life were mainly devoted to the composition of devotional works and to securing the papal approbation of the new order of the Visitation, founded by his friend St. Francis de Sales, and the beatification of St. Philip Neri. He died in Rome on the 17th of September 1621. Bellarmine, whose life was a model of Christian virtue, is the greatest of modern Roman Catholic controversialists, but the value of his theological works is seriously impaired by a very defective exegesis and a too frequent use of "forced" conclusions. His devotional treatises were very popular among English Roman Catholics in the penal days. Bellarmine was canonized in 1930 and made a Doctor of the Church the following year.